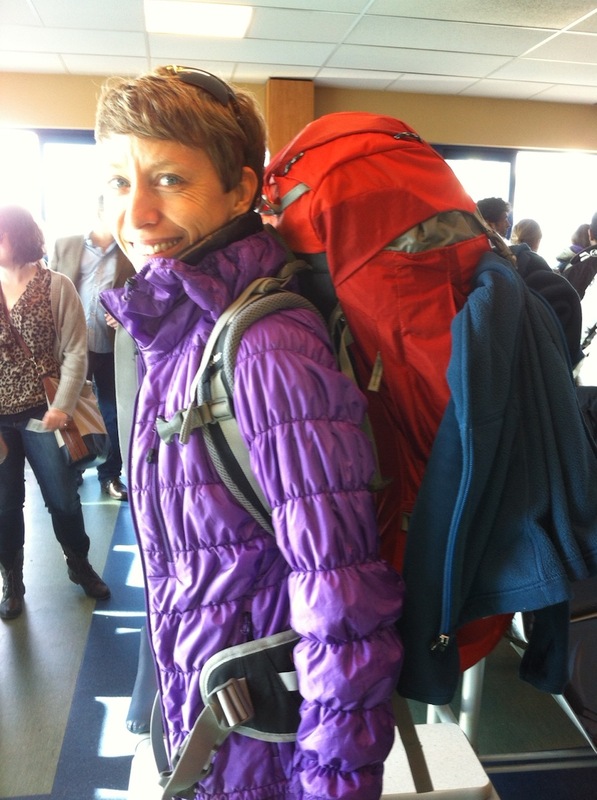 Trial run: backpacking and couch surfing! This past weekend we decided to take advantage of our weekend trip to Vancouver Island for the Victoria Marathon (#VictoriaMarathn) to try a few new things. First, we wanted to take our new Deuter backpacks for a spin to get a sense of their fit and fill. Second, we wanted to immerse ourselves into life on the road, so we decided to use transit and find a couch to sleep on through couchsurfing.org. Layer on the excitement of race weekend, and we were creating quite an adventure for ourselves! The backpacks are fantastic! We decided to take along our sleeping bags (which we won’t be doing for our RTW trip), along with our gear for the race and a change of clothes. Everything went in without a struggle – Richard even packed his new 3L Osprey hydration bladder filled to the brim. The packs are light and well supported, and we both found the padding and structure to be very well suited for our frame size. Two thumbs up from these happy vagabonders! Our journey was made a little more comfortable by driving our car to the ferry terminal, and parking it there for the night. With backpacks on board we made our way by foot onto the ferry, and settled in for the 90-minute crossing. On the other side we made the connection with the express bus into downtown Victoria, a 60-minute journey. We then walked 5 blocks to our couch surfing location. So convenient! I’d previously made arrangements with our hosts via the website mentioned above. Couch surfing is a very common activity amongst travellers, and we wanted to get a taste of what it might be like. Basically, the website connects folks looking for a place to stay with those who have a place to offer. Pretty great concept. And it’s free (well, there’s goodwill and a gesture of thanks to offer if you’re a decent traveller and human being!). Our hosts were a young couple who graciously welcomed us into their apartment and made us feel extremely comfortable. We shared a great dinner together that evening and exchanged travel tips and stories. We had a very good sleep on their fantastic futon. The next morning we left early to run our race, and returned to clean up before we hit the transit/ferry combo one more time. Our hosts were out when we returned to shower and pack our bags – they’d kindly left a text to say that we should make ourselves at home and lock up after we leave. How awesome! We couldn’t have asked for a better introduction to couch surfing! Unfortunately our race didn’t go as well as we had planned, but the rest of the weekend was such a great success. We hope that as we begin our travels (for real) in a few weeks’ time, that we have many positive experiences like this to recount, and that our backpacks continue to be as comfortable and reliable as they were on our trial run. The countdown is on to November 4! Excellent trial of backpacking - probably more crucial than getting the running bit right at the moment! You must be getting unbelievably excited now! Yep, excitement levels are rising and heading for locations uncharted. We've made huge progress with all the preparatory stuff in the last week, and it's beginning to feel like we will actually be ready when the time comes...only two weeks to go! Seems like you and Mark are settling in swimmingly back in London. Met you @ the dealership this morning(preparing to leave the car for an extednded period).We chatted about your trip as a fellow traveller im excited to hear from you and your wife on your trip.Ill travell vicariously through you,cant wait to hear about belize.Good luck. steve from coastal.